Digital technology has vastly broadened and complexiﬁed social life, levelling opportunities for communication and producing a new awareness of the importance of diversity of social relations, as well as of life on the planet. This book explores the ways in which social media, by encouraging human curiosity and sociability in relation to these developments, has highlighted for users their own nature as social beings who have discovered new ways to get along with each other, as well as new challenges. The complexity of networks on social media has created new kinds of conﬂicts, and new ways to mediate older kinds of conﬂicts, that have resulted in a demand for new forms of political participation, thus reinvigorating political activity, without extending the practice of ‘politics as usual’. However, with concerns for the planet in the back- ground, a tendency for elites and ordinary people alike to want to see a political solution to every problem in social life has become an unsustainable and troubling trend. This book argues that enthusiasms for social media can be tempered in a helpful manner through an engagement with studies of social media in relation to understandings of the history of modern social life provided by sources in classical and contemporary sociology and political theory. Social media makes possible new sociable opportunities and multiple publics, but at the same time represents important continuities with modern social life of earlier times, such as the respect in which it works to limit political action within the boundaries of a generalized public, thus constraining demagoguery and challenging the arrogance of elites who seek to impose certain forms of political life. Engaging with the work of Deleuze, Tarde, Simmel, Lazzarato, Latour, Harman, Heidegger, Arendt, Archer, Wellman, Bergson and others, Social Life and Political Life in the Era of Digital Media advances a new understanding of modernity oﬀered by social media, re-establishing the autonomy of social life over and against political life and re-articulating the relationship between the social and political. As such, it will appeal to scholars of social and political theory and cultural and media studies. "A central achievement of this book is to insist that, instead of rushing to analyze the surface effects of digital media, it is crucial first to contemplate the relationship between social life and political life. Toews masterfully scrutinizes this relationship by reinvigorating classical sociological thinkers such as Bergson, Simmel, and Tarde, and bringing them into dialogue with present-day theory and concerns. The result is a significant contribution to social theory." 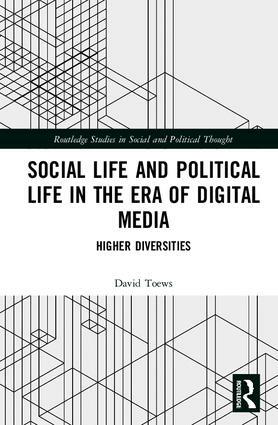 "Employing an original relationalist interpretation of such thinkers as G. Deleuze and G. Tarde, David Toews discusses the effects of new social media on relations in a world characterized by social inequalities and new political phenomena like Trump’s presidency. Anybody interested by the metamorphoses of this world and social theories should read this text written by a skilled sociologist." "Digital media have transformed social and political life. Everyone is aware of this, but few have tried to understand this transformation in such a profound way as David Toews in this book. Avoiding the common practices of facile praise or condemnation, Toews mobilizes resources from the sociological tradition to provide a nuanced analysis of our new time." David Toews received his PhD in Philosophy from the University of Warwick. An award-winning teacher and major grant recipient from the Social Sciences and Humanities Council of Canada (SSHRC) in the area of Sociology, he has been a faculty member in several universities and has published articles in such journals as Theory, Culture and Society and the European Journal of Social Theory. This series explores core issues in political philosophy and social theory. Addressing theoretical subjects of both historical and contemporary relevance, the series has broad appeal across the social sciences. Contributions include new studies of major thinkers, key debates and critical concepts.